A Woo and a Hoo. They gave me a day off today to set up my page! How graceful, as if a feather which has just become plucked from a Christmas Duck, flowing through the spilled cider of an old logger named Tikalziboot. An old, Finnish logger, may I add. I figured that I am pretty much done with my page now! If you have a suggestion, it would be as kind as the Eternal Nebula of Oolang Island [my birthplace] to leave it here so that I may read it later! Thank you! Being a baboon is hard. Constantly buanging to provide the beloved users of NuTang the psychosocial service of freedom and obscurity. We take pride in our work, though, I tell you! It is for all of our beloved admirers that we sweat blood and nuggets of molten wax. 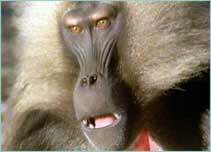 If you find that strange, you don't know much about Baboons! That is why I was provided with this space! I hope you can learn a lot of information, so you can say, "Hey! I know this information, do you?" And from there, that person will go, "Yes! I know!" As my motto provides, "It is worth it!"